11.06: We are seeing a difficult end to the decade of debt. 11.07: Tomorrow in my speech I will set out what we must do in order to put the economy right. 11.08: People are understandably angry at the bankers who paid themselves too much and are now turning to the taxpayer for help. but today is not a day for reckoning - that will come. Today is a day for reassurance and safety and protection. 11.09: The Conservative Party is not captive to big business. We must not use this crisis to bury the free enterprise system but to reform it. We believe in free enterprise and we understand it. But these discussions are for another day. Today is a day for protecting the financial system. 11.12: Britain may need to marshall public support for our financial system in the same way the USA has begun to do. The political wrangling that has taken place in America must not happen here. The Conservative Party is willing to work with our political opponents to do what is necessary for financial stability. 11.12: We will drop objections to who triggers the Bank of England process to rescue failing banks in order to ensure swift passage of the legislation. On GMTV earlier today Mr Cameron described the US House of Representatives' rejection of the bailout as "very worrying". [George Osborne is travelling to London today for talks with Alistair Darling]. Noon: PDF of full statement. The BBC is reporting that Shadow International Development Secretary Andrew Mitchell will tell the Party Conference that a Conservative Government will end aid to China. Britain currently gives £38m pa in aid to China although the communist state spent £20bn on this summer's Beijing Olympics. We hope that Mr Mitchell will also look at Britain's aid to India. The Department for International Development has already signalled an end to aid to China; the position with the world's other emerging supereconomy is much less clear. The Burning Our Money blog has noted a large increase in defence spending by India and wonders why UK taxpayers are paying for anti-poverty programmes in India: "Why doesn't the Indian government tax its own booming economy? Or why doesn't it, say, use some of the money it currently spends on defence?" It's time to stop UK aid to India and China and redirect it to the world's very poorest nations. "The Conservative Party’s lead over Labour has dropped from 19 to 12 points, according to a ComRes poll for The Independent, providing further evidence of a “Brown bounce”. It puts the Tories on 41 per cent, down three points on last month, Labour on 29 per cent (up four points), the Liberal Democrats on 18 per cent (up one point) and other parties on 12 per cent (down two points). Gordon Brown is seen as “best in a crisis” by 43 per cent of people, with 33 per cent opting for David Cameron. Mr Brown (43 per cent) is more trusted on the economy than Mr Cameron (33 per cent). However, Mr Cameron is regarded as more likeable by 53 per cent of the public, with only 28 per cent preferring Mr Brown. The Tory leader has a narrow lead on who is most competent to be Prime Minister, by 40 per cent to 38 per cent. The two parties’ economic teams were neck and neck when ComRes asked people which of them gave them most confidence in their ability to bring the country’s economic problems to an end. Mr Brown and Alistair Darling scored 39 per cent, as did Mr Cameron and Mr Osborne." Our graphic compares changes with this ComRes survey. (In case you cannot read the leaflet inserted in the bottom left it's from the Conservative Humanist Association). Coffee House has a photograph of David Miliband and his banana! 1200: The speech may well include another big announcement. Our guess: something on council tax. 1206: Great video summarizing Tory policies before GO speaks. Will upload later on to PlayPolitical. 1208: GO promises to defend capitalism during this time. 1209: Not every problem can be blamed on Labour but Brown sat in Downing Street when regulation failed and debt soared. 1210: Brown borrowed more than households and hid more borrowing off balance sheet than the banks. 1211: The party is over. 1214: Ultimately the bankers are responsible for these problems. I am not an ideologue who thinks that the market can do no wrong. Bankers will be held to account if they pay themselves big dividends when they should be rebuilding their balance sheets. 1216: Unlike Labour we are not bedazzled by big money. We were the first to propose tax on non doms. We don't oppose restrictions on short selling. It was the Conservatives who three years ago published a major report on debt. 1218: We will fight next Election on reducing borrowing. 1220: The cupboard is bare. Tax revenues have collapsed. Unemployment is rising again. Labour have done it again. 1223: Gordon Brown is spending like there is no tomorrow. For him there may be no tomorrow. The only Golden Rule is that you can't trust Labour with the public finances. 1227: No upfront tax cuts paid for by even more borrowing. 1228: Conservatives will freeze council tax for two years if local councils cooperate on making savings. 4pm: Authorised text of speech. The Conservatives will not build a third runway at Heathrow airport - so cutting 66,000 flights a year - but will instead work with the private sector to build a £20bn, 180mph rail link between London and Birmingham, Manchester and Leeds. There would also be a high speed link between King's Cross St Pancras and Heathrow airport - (although Boris Johnson may have moved London's airport to the Thames estuary by then!). Theresa Villiers, Shadow Transport Secretary, told The Guardian that the move was "seriously green". WARNING: TO AVOID DATA LOSS, KEEP OUT OF REACH OF LABOUR. Thursday: Thousands of copies of Reconstruction, Renewal, Repair. were distributed to conference-goers after David Cameron spoke. It neatly summarises party policies. A PDF of it is here. Tuesday: "The Conservatives want to amend Section 2 of the Health and Safety at Work Act 1974 to ensure that protecting the public from risk is given priority over the risk to [police] officers" (BBC). Monday: Conservatives pledge 45,000 increase in the number of single rooms in hospitals by end of first term at a cost of £1.57bn (Guardian). Monday: George Osborne announces two year freeze in council tax for local councils that help to deliver economies (Watch). Monday: A new high speed London to Birmingham rail link by 2027 (and no third runway for Heathrow). Monday: A new GI Bill that will give servicemen much greater access to education (BBC). Sunday: Tory Government would establish an Office of Budget Responsibility to publicly account for progress towards a balanced budget (this idea was first proposed by the FT). Sunday: Twelve private sector CEOs will be recruited to become "superheads" for major Whitehall Departments (referred to by The Sunday Times). 3pm: CCHQ has now told us that this is rubbish and do not know how The Sunday Times could have written it! On Andrew Marr's Sunday programme David Cameron discussed the Conservative commitment to establish a new Office of Budget Responsibility. The Tory leader said that the taxpayer-funded Office would regularly produce an independent assessment of progress towards a balanced budget. It would be very politically difficult for a Conservative Government to ignore the Office's assessments about spending control, he argued. In effect, said David Cameron, the Conservatives are imposing a "straightjacket" on themselves for when they hope to be in office. Andrew Marr then quizzed David Cameron on the party's spending plans but asked all the wrong questions. He focused on the period up until 2011 when the real issue is what Conservatives will do beyond then. Mr Cameron did, however, cast doubt on Gordon Brown's ability to keep spending growth to 2%pa over the rest of the parliament. He argued that the PM's speech to Labour in Manchester included a number of new spending pledges. There was a danger that Brown would pull the walls of the building down upon himself before he left office. "The scorched earth policy". Asked about the looming nationalisation of Bradford & Bingley he said that he favoured Bank of England-led reconstruction rather than Labour's rush-to-nationalisation. He did offer to work with Labour in a bipartisan way to introduce fast reform of deposit protection arrangements. On issue-after-issue (eg education and Trident) he said that the Tories have demonstrated a willingness to work with Labour in the national interest. David Cameron said that there'll be no easy and cheap bashing of the market from the Conservatives. Such bashing won't save a job or help pay a mortgage. But Gordon Brown's regulatory mechanism has comprehensively failed. Under a Conservative government, banks will be required to be better capitalised and he also noted other Bank of England reforms (as reported by ConHome yesterday). On Monday, George Osborne is set to announce details of Conservative economic proposals, geared towards resolving current difficulties. Today, a policy of increased powers for the Bank of England have been revealed - including the ability to rescue failing banks and to monitor consumer and corporate debt. The announcement follow's Cameron's interview in today's Daily Mail, where he revealed proposals to take away from the Treasury some of its oversight over taxation and government spending: "We are at the end of 14 years of economic growth and we have got an enormous deficit. What we need is external judgment of fiscal policy." The BBC's Robin Chrystal suggested Conservatives are "likely to present their proposals as more far-reaching and on a par with Gordon Brown's decision to give the Bank independence in 1997". David Cameron has pledged to use this week's conference to announce detailed proposals geared at addressing current economic difficulties. "Taking a leaf out of Margaret Thatcher’s 1970s cookbook, the Tory leader said the plan would be based on “good housekeeping” and would be designed to restore confidence and stability to the UK economy." Speaking to a Shropshire local newspaper, Cameron claimed Labour's focus on its own internal divisions was preventing the government from focusing on public concerns like the economy. As reported in this morning's Independent, ConservativeHome has issued its survey of grassroots opinion this morning - on the eve of the Birmingham Conference. Support for David Cameron at a peak amongst the grassroots - higher than when he first became leader. William Hague, Eric Pickles, George Osborne, Chris Grayling and Michael Gove are the five most popular members of the shadow cabinet. 91% of Tory members expect the party to form the next government. 64% want more policy boldness. Only 15% of Tory members expect David Cameron's first Government to be transformational in the way that Margaret Thatcher's governments were. 63% believe a large reduction in taxation is needed to boost Britain's flagging economy. Members believe that the proceeds of a tighter public spending settlement should be shared almost equally between reduced borrowing and reduced taxation. ICM for The Guardian: Tories 41% (-3%), Labour 32% (+3%), Liberal Democrats 18% (-1%). The Leader's speech is always the highlight of Conservative Party Conference but the most important performance will be given by Shadow Chancellor George Osborne. 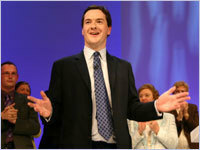 As recently as the Spring Forum in Gateshead, George Osborne was clinging closely to Labour economic policy. Tory strategists had decided to adopt the tactic of economic disarmament. By matching Labour on spending and by disavowing "unfunded" tax cuts the Tories hoped to prevent prevent Labour from presenting the party as an economic risk. By neutralising the economy as an issue the aim was to encourage voters to focus on the areas of policy where Conservatives are genuinely radical: crime, welfare, education. In the middle of an economic crisis - with Britain the most poorly-positioned of nearly all the developed economies - that policy of economic decommissioning is no longer tenable. Voters want to know how the Tories will get the economy going again. And they deserve better than ill-thought-out differences. The Tory idea of bringing Chapter 11 to Britain was a rushed idea that would only protect underperforming businesses. Can George Osborne deliver? Some commentators are noting his inexperience but we are increasingly confident in his abilities. Last year, in Blackpool, George Osborne's inheritance tax announcement transformed the electoral landscape. Mr Osborne has made a lion's share of the pivotal political decisions of David Cameron's leadership: recruiting Andy Coulson, rejecting über-modernisation, overhauling the Boris campaign. But he now faces the biggest test of all: Can he overhaul his own economic policy? Does he have a plan to undo the errors of the Brown years? In recent weeks he has made a good start. He has signalled that the Conservatives will pursue a more prudent public spending settlement. Green tax hikes are likely to be kicked into the long grass. He has joined David Cameron and Boris Johnson in defending the City of London from those who want to over-regulate it. There is already a defining plan for social reform that will reduce the long-term demands on the public purse and there are good ideas on tax simplification. Tories are divided on whether poor economic circumstances mean that tax relief is more necessary to boost the economy or less affordable because of Darling's extraordinary levels of borrowing (much more on this tomorrow). Where there can be no doubt is that there has to be very serious spending restraint. A former economic adviser to Mr Osborne, Douglas McNeill, told yesterday's FT that spending restraint was far too difficult and taxes would have to rise. That would spell economic disaster for an already overstretched corporate sector. We hope that Mr McNeill doesn't speak for his former master. Most families in Britain are facing very strict constraints. After years of tax rises it is not a time for further taxation but for a "sharing of the proceeds of pain". 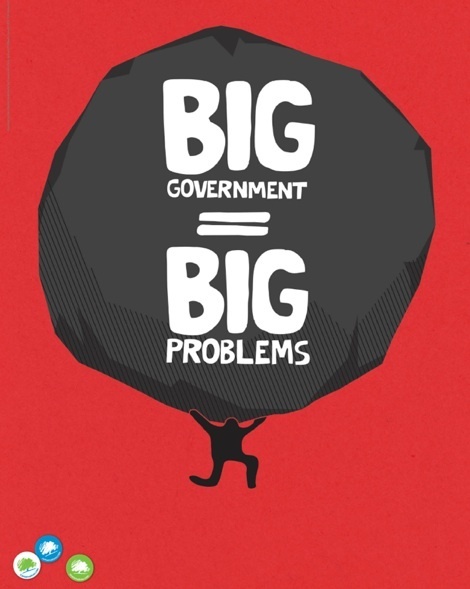 The public sector is bloated and there must be discipline. A recruitment freeze in the public sector should be the starting point. We also need changes to procurement practices, IT projects and the budgets for quangoes. 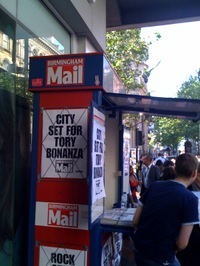 That's the message we hope to hear from Mr Osborne in Birmingham. 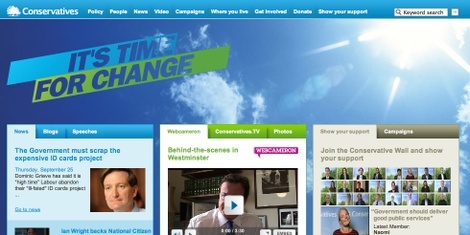 Today sees the launch of the new conservatives.com and, on first impressions, it looks really good. A very clear summary of policy, Where We Stand. Regionalised sections; eg South West England. We are told it's a work in progress. More features will be rolled out over coming weeks. It's not the radical platform we would like to see but it's a big leap forward and keeps the party well ahead of our political opponents. Most encouraging is the fact that a team of six people are now dedicated to new media within CCHQ. That should make the whole exercise sustainable. Warmest congratulations to the folks behind this relaunch. Anthony Browne, the outgoing director of Policy Exchange, has written for today's Independent - backing what he admits is a "politically dynamite" case for an amnesty for illegal immigrants. Mr Browne is about to join the Mayor of London's office, as head of policy. Boris Johnson himself backed an amnesty during the mayoral race - a position that puts him at odds with David Cameron. Mass deportation: Mr Browne dismisses this as very expensive and unrealistic; "No country that sees itself as civilised wants to send immigration officials into schools, yanking distraught children away from their distressed classmates." Accept the status quo: But this prevents a huge number of people from becoming fully participating members of society. An amnesty: Mr Browne believes that this is the best option and will benefit the long-term productivity of the UK economy. He calls for an "earned amnesty" for those who have been resident in the UK for a short number of years and haven't been found guilty of any criminal offences. The most common objection to an amnesty is that it will only encourage further illegal immigration. Spain, for example, has granted six amnesties. The first amnesty twenty years ago granted residency to 44,000 people. The most recent and sixth amnesty - in 2005 - involved 700,000 immigrants. Anthony Browne says this can be avoided by doing much more to protect Britain's borders. > There is an extended profile of Policy Exchange in The Guardian, including an interview with its new Director, Neil O'Brien. [On our video the Sky interviewers' questions are mute, DC's answers aren't]. Mr Cameron recommends urgent action on deposit protection and a lead role for the Bank of England in managing financial rescues. The underlying economic problem, he says, is too much debt. He had a gas bill over £1,000 last year and an oil bill of over £1,000. Crime isn't just about punishment, but about mending the family and dealing with other root causes. "Afghanistan, Afghanistan, Afghanistan" is Britain's number one foreign policy priority. Gordon Brown "thumped the poor" when he abolished the 10p tax band. It was an "appalling" decision. In today's Telegraph, Iain Martin notes the depressed state of Labour's Manchester conference this week, and contrasts it with the temptation among Conservatives to celebrate their first conference ahead in the polls for 21 years. "Next week, the task of the Tory party is to keep its feet firmly planted on Planet Earth. If the leadership's staff can arrange for a ban on the sale of champagne within the conference perimeter, they should issue the order without delay. In this age of the mobile camera-phone, images of gangs of young Tories swigging Pol Roger will find their way to the picture desks of tabloid newspapers. The tabloids will probably provide the champagne, given half a chance. "This is not a time for wild Tory partying: there is a lot to be serious about, to quote the Prime Minister. Behaviour that suggests excessive frivolity, or a lack of seriousness, in the face of dramatically altered political conditions will be punished by voters. They want to hear what the Conservatives have to say about the condition of our times, and expect sober answers. "To that end, David Cameron has cancelled an event planned for Sunday afternoon to celebrate recent successes in London and beyond. Instead, there will now be an emergency debate on the economy, in which both Cameron and his shadow chancellor, George Osborne, will speak." Yesterday's opinion poll showing a lead of only 11% will disappoint activists, but may help combat the complacency that Iain Martin identifies as being so dangerous. ...but all mid-conference season polls are pretty meaningless. Remember this one? Top Blair aide Matthew Taylor identifies Brown's fundamental problem of "authenticity"
At an event discussing Leadership at the London School of Economics yesterday evening, Matthew Taylor attacked Gordon Brown for having "consistently said one thing and done another". Now Chief Executive of the Royal Society for the Encouragement of Arts, Manufactures and Commerce, Taylor was Head of the Number 10 Policy Unit under Tony Blair, and later Blair's Chief Adviser on Strategy. His words represent the first unambiguous public attack on the Brown government by a key member of the Blair camp. On policy, Taylor criticised Brown for the inconsistency of claiming to be for social justice and then cutting inheritance tax. On Brown's style of government, he charged that the Prime Minister had pretended to be for a new politics and then played the old political games on when to hold a General Election. Brown had presented himself as being for the politics of the big tent while briefing from Downing Street even against members of his own government. Taylor argued that this authenticity issue more than anything else had damaged Brown with voters. This dislike was not to be traced to him being Scottish or brooding, but to a public feeling that Brown does not match up to their desire for a leader who is both authentic and effective. The Sun: "This speech won Mr Brown precious breathing space. But his exhausted face revealed the strain this battle for survival is inflicting. His ‘great clunking fist’ still managed to land a blow on David Cameron. Mr Brown portrayed the Tory leader as a carpet-bagger selling snake oil and patent cure-alls. Mr Cameron must respond next week by filling the gaping holes in Tory policy — on Europe, taxes, spending and the NHS. Otherwise Mr Brown’s charge will stick." Daily Mail: "Well, he did it. On Monday, the Mail said Gordon Brown had to make the speech of his life if he was to silence Labour's rebels and revive battered confidence in his leadership. Yesterday, he delivered it. Gone was the defensive, beleaguered Mr Brown of the spring and summer, worn to exhaustion by the cares of office and the treachery of his colleagues. In his place stood a defiant Prime Minister, infused with a new energy and passion, hungry to carry on in the job and meet any challenges it might throw at him." Peter Oborne: "Gordon Brown rose politically from the dead. Of course, it is still not possible to be certain of his long-term - or even medium-term - survival. But one thing can be said with total certainty. 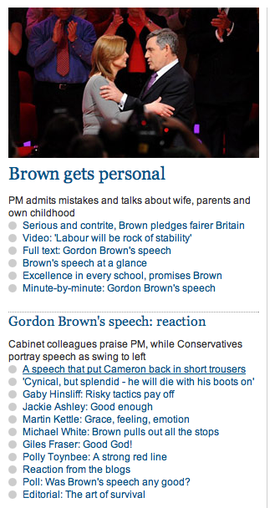 Gordon Brown remains the biggest man in the Labour Party, and still the most potent force on our national stage. The truth is that none of his mooted leadership successors - not Jack Straw, not Alan Johnson, not Harriet Harman - could make a speech half as good." What a load of rubbish. It's very rare for a speech to change anything in politics and yesterday's speech was far from exceptional (the attempt at an Al Gore kiss being the most notable feature of it). We make a prediction: Labour's average poll rating will be broadly the same a fortnight after the party conference season as it was a fortnight before. Leadership speculation will continue. UKplc will remain at the bottom of the G7 league table. The Westminster village loves speeches and slogans and reshuffles but the most stubborn fact in British politics is the steep decline in household disposable income. Brown did nothing to address that yesterday and that is why he and Labour remain headed for electoral doom. Are the Conservatives heading for a large victory? Should the party now be cautious in policy development and protect the opinion poll position? Do you fear John Reid as Labour leader? Should Michael Howard be in David Cameron's first Cabinet? Will David Cameron's first government be transformational or managerial? What do you think of Sarah Palin? 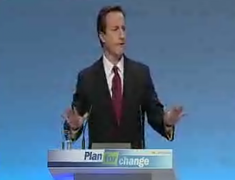 Should David Cameron use his Party Conference speech to warn the British people that very tough times lie ahead? Should savings from Labour's spending plans be used to reduce borrowing or taxation? Is it time to suspend plans for higher green taxes?